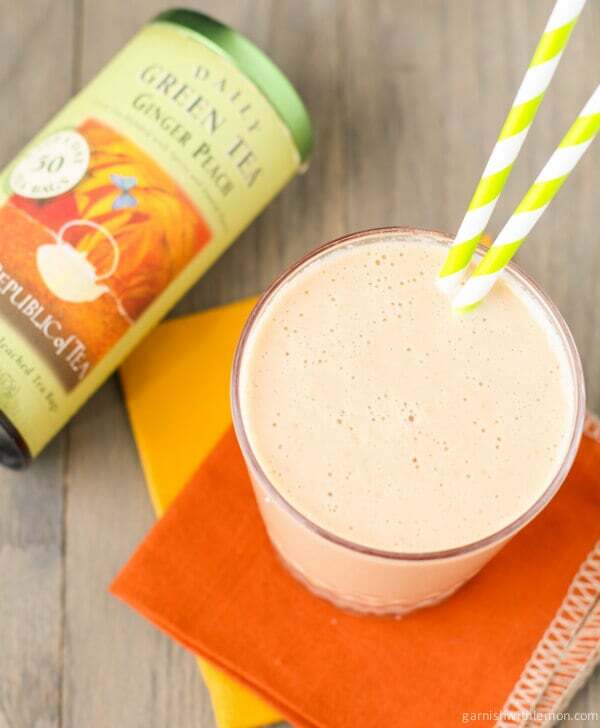 Start your day off right with this healthy Ginger Peach Green Tea Smoothie! My husband used to travel quite a bit for his old job, and his trips to Asia hooked him on a cultural staple: green tea. So naturally he tried to get me on board, too. Now I’m a tea drinker, so you wouldn’t think this would be a hard sell. But the authentic green tea he brought back from his travels just didn’t do it for me. I tried, I really did. But I just didn’t care for straight up green tea. So I started looking for substitutes, and my “house tea” was born: Ginger Peach Green Tea from The Republic of Tea. Just adding that bit of peach flavor and zip of ginger made it the perfect green tea for me. But who would have thought it would also make a tasty addition to my daily smoothie? I’m pretty sure I’m late to the party on this whole tea-in-smoothies thing, but better late than never, right? 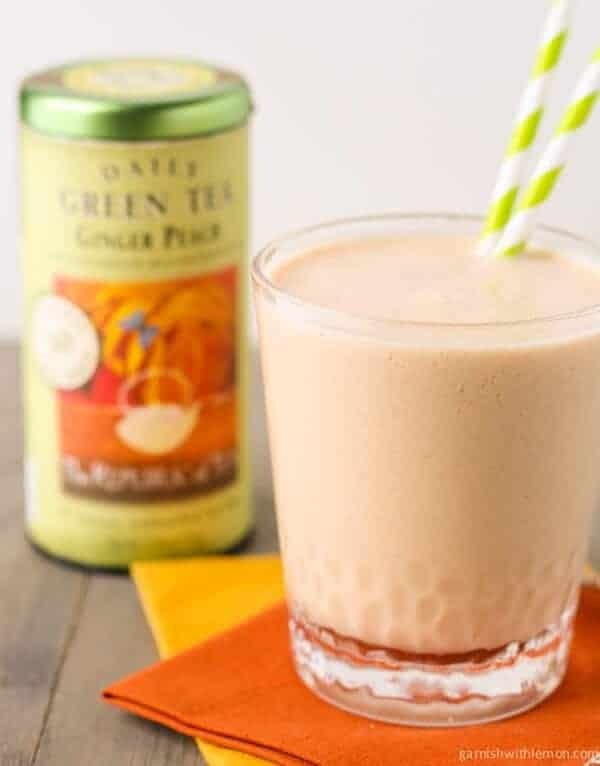 This Ginger Peach Green Tea Smoothie has juicy peaches, protein-rich vanilla greek yogurt, a bite of fresh ginger, half a banana for sweetness and some brewed and cooled Ginger Peach Green Tea. That’s it, folks. The rest is just blender magic. I love it as a super refreshing pick-me-up to tide me through the mid-afternoon munchies. Let’s be real; I know many of you are far more adventurous than me when it comes to making smoothies, so serve ‘em up! What is the most inventive ingredient that you put in your smoothies? Leave your thoughts in the comments below. So funny.. I JUST tried this tea and just about died of tea heaven…it is delish! Totally lovin’ the idea of using it in a smoothie..Pinned! What a coincidence, Taylor! Hope you enjoy the smoothie! Ginger peach is my absolute favorite tea, I have almost every night. Now I can enjoy it for breakfast too! I love this smoothie!! I know! It was a forehead-smacking moment for me, too, Christina. I like green tea but I don’t *love* it without sugar. I bet this smoothie would fix that right up for me! What a great idea!!! I hope you try it, Heather! I’m drinking a The Republic of Tea, hot tea this very moment. Ginger peach is my favorite, but I switched it up today with a pomegranate. What a brilliant idea to use it in a smoothie! They make great teas, don’t they? Love! I love green tea! In addition to my coffee addiction, I love green tea every night. This smoothie is right up my alley! Yay for green tea lovers! I love green tea in smoothies! Such a great way to add a little extra energy and antioxidants. This looks delicious! I currently live in China and I still can’t get used to green tea. To think- the Chinese just leave tea leaves in their little portable mugs…I do love me some jasmine tea though. I bet there would be a place for that in this smoothie combo! Jasmine tea sounds like it would be a total winner, too. Great idea, Christine! Ginger-Peach sounds like such a heavenly combo. Looking forward to trying this. Does anyone know what the calorie count is on this smoothie is? It sounds delicious, I love ginger in anthing. Hi Gina, we don’t post nutritional information, but there are a wealth of online calculators out there that will do the work for you, including this one: http://recipes.sparkpeople.com/recipe-calculator.asp. Hope you enjoy the smoothie! Approx 200 calories depending on your yogurt. 55 for the banana 60 for the peaches and I get 85 for the yogurt. 0 for everything else. This sounds absolutely delicious! I love ginger peach tea. It’s super yummy. & the pic – looks scrumptious too thanks for sharing. I liked this combination of peach and ginger. I referenced your recipe in a recipe post if that is OK. This is very delicious, added in the vegan protein powder too! Thanks for the recipe. So glad you enjoyed it, Alexus! Thanks for stopping back to let us know how it worked out for you! It really looks good & I love how easy it is! I love banana & almond milk in my smoothie. Honestly, I’ve no experience with green tea in my smoothie, but your idea is seems perfect. I will try this asap.